I know most of you have probably tuned out on the Astros by the now. Hell, most of you probably tuned out on the Astros back in March. But it's still over a month until the Texans start disappointing everybody again. The NBA may not be playing for a long time. And the Cougars and Owls don't kick off until Labor Day Weekend. So it's not like there's a lot going on with the local sporting scene at the moment. Thus, allow me to present you with some reasons to once again pay attention to the Astros. 1. Not only are the Astros on pace to lose a 100 games, they're on a pace to lose 109 games. And only four teams during the last 50 years have lost more games after 100 games than the Astros. 2. The non-waiver trade deadline is fast approaching. And once again it appears that the Astros might be sellers. So watching now might be your last chance to see fan favorites Hunter Pence and Michael Bourn. 3. If you're going to watch your fan favorites for the last time, you might want to get in on the speculation about where they'll land if Ed Wade actually pulls off a deal. The rumors about Pence have included the Red Sox (which based on their treatment at Minute Maid earlier this month are like Hunter being traded to Houston's home team), the Braves, and the Phillies. Talks for Bourn are primarily centered on the Braves. 4. Speaking of the trade deadline brings one to lame duck GM Ed Wade. It's pretty common knowledge that once Jim Crane is finally given the approval to purchase the club that Wade will be one of the first people fired. So by tuning into the trade dealing fun you can watch as Wade works on acquiring his new job as Special Assistant to Philadelphia Phillies GM Ruben Amaro. 5. Then there's the nightly round of fun that comes from the Brad Mills lineup card. Get on to twitter every day around 3 p.m. as @alysonfooter posts a photo of the lineup, then join in on the outrage as Brett Wallace is once again benched against a left hander. 6. Jordan Lyles has yet to get a win as a starting pitcher as part of the Astros rotation. After yesterday's game, he has tied Bruce Von Hoff as the only Astros pitchers to go winless in their first 10 starts with the team. 7. So that leads to the obvious question: what happens first? Does Brett Wallace get a start against a lefty or does Jordan Lyles gets a win? 8. Better yet: does Lyles get a win before Wallace hits a home run with a runner on base? 9. The Astros have another of those Faith and Family Nights coming up, only this one's called Praise In The Park. With the way this season is going, the team will have more nights honoring Christians than they will wins. 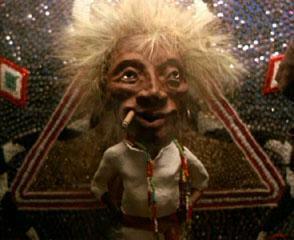 Seriously, what's it going to take for the Astros to have a Jobu Night? 10. The Astros' next four games are in St. Louis. So tune on in and watch Lance Berkman continue to demolish his former team. 11. There's always the fun of watching the Astros and play the "Guess Along With Manager Brad Mills" game. For instance, if Michael Bourn's on first base, do you waste an out and sacrifice him over to second base, or do you do the smart thing and let him steal second base? If you pick the smart thing, you're wrong. 12. There's always the fun of wondering by which method the Astros are going to use to lose each night. Will the starting pitching be good only to see the bullpen implode? Or will the pitching be great but there be no offense? Will the offense put up lots of runs only to see the entire pitching staff do an impression of J.A. Happ? Will they be keystone kops on defense? 13. Despite being the worst team in the majors, the Astros still have a chance to end up first in some individual categories. For instance, staff ace Brett Myers is still in contention for the most home runs surrendered in the season category. 14. Then there's the big fan favorite: watching third base coach Dave Clark send Carlos Lee home from second on a single to left field while holding up Michael Bourn and Hunter Pence on just about anything. 15. The team's newest player, Jose Altuve, has a hit in all four of his games this season. Just 52 more games to go until he's up there with Joe DiMaggio.